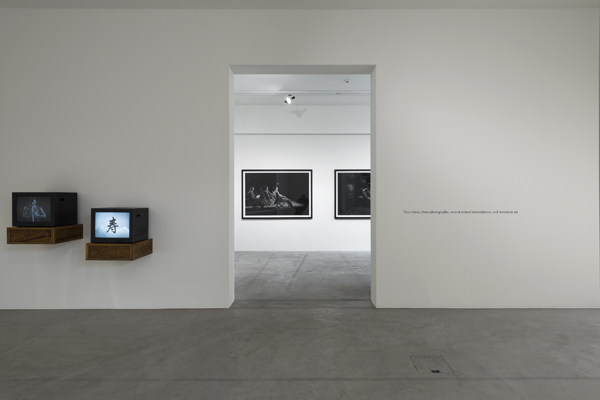 View of “Yan Xing: Standard Exhibition,” 2014. The Beijing- and Los Angeles–based artist Yan Xing is known for creating intricately staged installations, photographs, videos, and performances that play on registers of high camp, melodrama, and sincerity. For his recent solo exhibition at Galerie Urs Meile in Beijing, he presented new works including The Collectress, 2013, which is based on the novels and paintings of Duan Jianyu. “Yan Xing: Standard Exhibition,” his first solo show in Switzerland, runs from February 14 to April 12, 2014 at Galerie Urs Meile in Lucerne. THE PHYSICAL FRAMING of my work—the way it is presented to a public—is very specific. This is because I want to control the viewer’s experience. It’s an overt rejection of audience participation. You only see what I want you to see, and how I want you to see it. Sometimes the reference point for the work is broad—geographies, survival, humanity, or universal values, for instance. In other cases, the reference is a particular artist or artwork—Robert Mapplethorpe or Edward Hopper’s 1927 painting Drug Store. I think artists should be open to exploring all types of categories. For The Collectress I worked with the specific reference point of a contemporary artist and author: Duan Jianyu. This was new for me. The installation consists of twenty-one paintings of landscapes and two sculptures on the floor that resembled farm implements. For me, this work was a new direction: It has a modernist aesthetic that I’ve never used before. I’m an avid reader of many of Duan Jianyu’s books. I’m probably among the foremost researchers of her paintings, too. Many of her stories and paintings are flooded with tacky aesthetics; she highlights this superficial phenomenon of building and rebuilding that can be seen all over China’s metropolises—it is common nearly to the point of almost being kitschy. For The Collectress, I attempted to find the places she has written about—typically in great detail—but in the end, I learned that they were all fictional. My installation is concerned with the complicated relationship between the stories that art tells and art in actuality. An aspect of the project that many people didn’t know about––but which was part of the conceptual imagining of the work from the beginning––was flying Duan Jianyu out to the opening at Galerie Urs Meile in Beijing. The gallery bought her a plane ticket, put her up in a luxury hotel, and gave her a private car and driver. I wanted to make it seem like a voyage, which added various layers of meaning to the work. This layering is key for me and I am beginning to see that The Collectress was a springboard for the work I am planning to make in the future. For my current show in Lucerne, I am not making any new work, but rather exhibiting work I’ve shown before. I am still in the planning stages of a new body of work, which has a lot to do with moving to Los Angeles. I’ll have the opportunity to reassess a lot of the hardware and tools I use in my practice. I’ve been living in Beijing for four years, and my ideas have melded with the fabric of the city. I want to make change that is more significant than a residency or a trip—a life change. To stay would merely be to continue realizing my currently ongoing projects and ideas on a bigger scale, and this is not of interest to me.